Just supposing I was to build a Delta about as tall as my room would allow, which would be about 2.2 metres, what sort of print volume (diameter and height) could I reasonably expect? You could also try to go for the Hangprinter with those design parameters. My delta is 1m high and has a build volume of 300mm diameter X 400 to 460mm high. So if you scaled it up by 2.2 you would get about 660mm diameter by about 900mm high. In practice a bit heigher because some of the height overheads wouldn't need to be scaled. You can trade height for area. Thanks all. Is there any sort of "Golden Ratio" of height vs diameter that works best, or is it largely immaterial? In terms of accuracy, reliability and ease of calibration, is there any difference between "tall and slim" vs "short and fat" if you get my meaning? There is no golden ratio. Given a limitation on total printer height, you can trade printing height off against printing diameter however you wish. Some time ago I converted my Mini Kossel from 160mm print diameter to 300mm print diameter, using the same vertical extrusions. The cost of the increased print diameter was that the printable height dropped to around 90mm. OK. Thanks for all that. I'll mull things over for while. I'm undecided whether to "upgrade" the CoreXY to single colour by making an X carriage adaptor to take something like and E3D volcano, or build a separate dedicated single colour printer. Height isn't really a problem you can make them as tall as you want, but there is obviously a limit to how tall parts can be before they detach. As I'm sure you find with your current machine. Greater width reduces available z height as you need longer arms. Is there an optimum width to height ratio? A ratio which gives the greatest printable area for any given volume of delta printer? 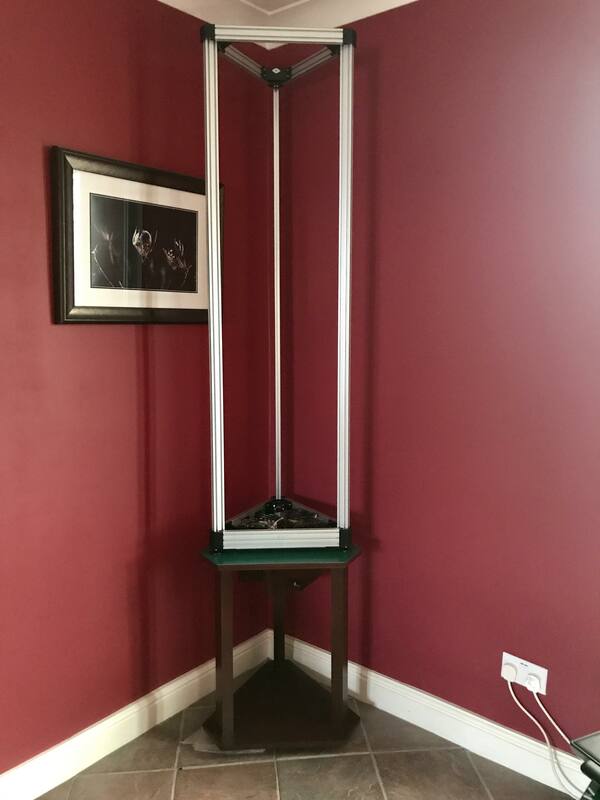 Is it the proportions of something like (the very popular) Kossel? Why were they chosen? Also as size increases how do you plan to tackle the extrusion volume issue? Diamond 5 way and a 1.2mm nozzle? I always find these "big box" printers a bit ridiculous they can print a chair but only if you have 7 days and 20 reels of filament and are willing to swap them when necessary (maybe less often with diamond 5 way). Or go to pellet extruder and 2+mm nozzle? Some sort of dual nozzle system (one massive and one small) for bulk infill and perimeters respectively, might give the most flexibility. A 0.9mm nozzle is fine but 1.2 might be fun and you don't need a Diamond 5 colour (I wouldn't even consider putting one on a Delta). I reckon a volcano might do. I can get filament in 2.3kg reels which last a while - wouldn't have to get up in the night to change it and I can always pause and resume. I hate sitting on plastic chairs so wouldn't consider printing one :). The coffee table I did wasn't too bad - 1mm layer width and 0.7mm height took about 19 hrs each half https://www.youtube.com/watch?v=C4oljUKE6KM&t=205s. Actually, I'm working on a design for a printable version of this sort of thing https://www.erzgebirgepalace.com/Christmas-Pyramids/4-tier-Pyramids/4-Tier-Christmas-Pyramid-Forest-Design-135-cm-53-inch::6983.html?utm_campaign=shopping&utm_source=merchantcenter&utm_medium=googleshopping&utm_content=google-uk&gclid=Cj0KCQiAkZHTBRCBARIsAMbXLhGa6bDNieFp9y5GSWdT3mZ3Zy1FcxQn5EtkEceQYyVQMTUXx0KwLd4aAipHEALw_wcB. Powered by a motor of course - candle power is maybe not such a good idea when it's made out of plastic. For sure I could make it in sections but it might be fun to print in one go. It's easier to print the columns when they are attached to something. The entire thing is mostly hollow so it won't actually consume much filament but it'll need a "normal" size nozzle so for sure, print time might be horrendous. Deltas are fun, mechanically simple (but they need to be built precisely), and great for tall prints. Here https://tractus3d.com/our-industrial-3d-printers/ are some delta printers of various sizes. The larger ones are powered by Duets, I don't know about the smaller ones. Not sure it helps, but my Delta based on DC42's design is 1.7+ meters tall and has a 380mm dia bed, with about 350mm reachable. The extra size helps to keep the clips I use for the glass well out the way. Here's the frame of the printer during the build on a table specially made for the printer, the spool is mounted under the table top on a lazy Susanne, I really must take some new pics of the finished printer. at that height without cross bracing is the frame not somewhat flexible? what does all the extra height with the only slight extra width (compared with mine or DC's delta) allow you to do? Surely once a part is 800+mm tall it has a very high chance of detaching from the build plate just due to the leverage any impact with a blob or suchlike would generate. If this machine were significantly wider as well as taller then I could see the obvious benefit. Makes me wonder if you could fix attachments to the frame to print on a build plate at the bottom, then insert another build plate slightly above the first one, and immediately begin printing on that, then another etc.. With fast calibration and a good probe (smart effector/piezo) you could print almost straightaway. Its only a gimmick but it would be quite cool. 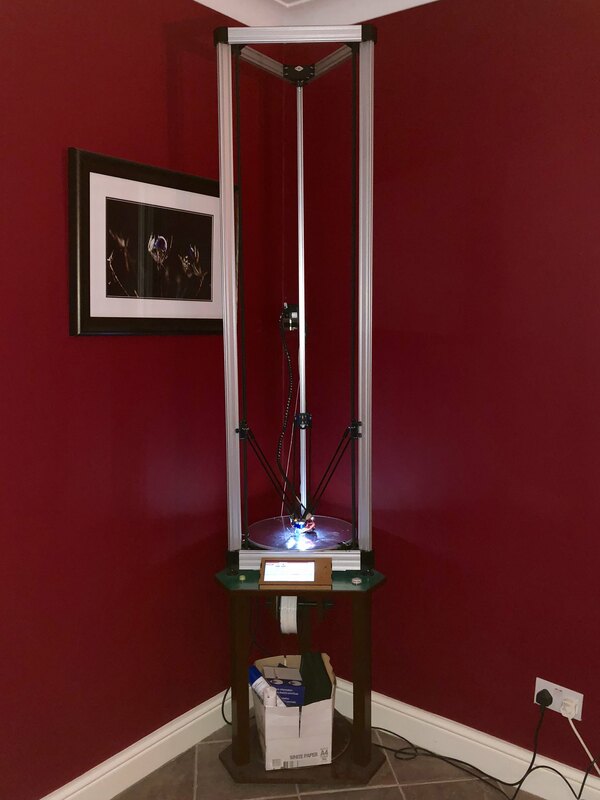 IMO a lot of height is rarely ever used, my 1m tall delta could be 600mm tall and it would have only prevented me printing about 2-3 objects in the last 12 months. I'm using the metal 20x40 corners and extrusion and so its stayed quite stiff, there was very little extra cost in going higher which is mainly why I went with the height with the option that I could always make it shorter if needed later. I wanted to use linear rail but the suppliers I found no longer had it long enough. And one seller on Ali kept asking for more money after agreeing a price, luckily I got a refund from them. I've made some test tubes over a meter tall and they did not detach and I like the idea of making tall vases some day with it. Heres a pic of it finished and running. Dekingman, you may find this helpful. It is a calculator for Delta Printers. Still somewhat in Beta; very accurate for the RobotDigg 2040 corners (the default). I'm building a largeish delta (see photos) around a DuetWifI. 1.5 Meter tall overall, 600mm build plate. This URL presets the calculator to my final sizes. Danal, get some toothed idlers. You'll thank me later. Also, I forgot to mention, there will be a ton of diagonal bracing. Haven't decided exactly what/where; still very clear that it is needed. Or just twist your belts…. Lets see if there is an optimum. Is there a way to do this by mathematics/simulation? If you know how please let me know (on one of the threads above).